This is the day, the one I’ve been dreading/anticipating happily/motivated/unmotivated for since I started thinking about college. The Purge: (proper noun) the time in a young girl’s life where she feels the need to root out disorganization and unnecessary items from her humble abode (also known as her bedroom). The Purge requires many days, weeks, and/or months to complete as it skips no drawer, leaves no shelf untouched, and aims to downsize possessions and clutter in an attempt to be ready to leave home at the end of August. So, today I began The Purge. It has humble beginnings, but I already have half a garbage bag of things that came from piles that have been sitting in various places in my room for a year at minimum. Here I am, about to begin the purge. I look happy, right? ready to start work? Well, here’s how I really feel. are you kidding me? I’m selling my soul to this organizational project? And here is what I will look like when it is all done. it will take an enormous toll on me, I’m sure. I’m a sentimental person. I see that calculus test where I finally got a score to be proud of, and I want to keep it. Previously, it was siting in one of the eight or so piles around my room. Now, it has a happy home in a folder, and lots of his paper buddies from the same pile are in this lovely white garbage bag. You’re probably feeling pretty good about your cleanliness right about now. I’m looking around at my room at all these absurd things I’ve saved, and I’m just too embarrassed to list any of them for you. So, I’ll just sum it all up with the fact that The Purge is much needed. 1) Never forget to make the words The Purge bold while blogging about said task. 2) Have a room with organization that I will be proud to photograph and display online. The Purge has begun, folks. And it needs to be more than just my room. I need to purge my life as well, as I’m sure we all do from time to time. There’s the daily forgiveness purge, the renewal that has to happen each day in order to have a real relationship with God, but then there’s the deep cleaning. It’s not just repenting of sin; it’s taking a good hard look at who I’ve become since I last looked in the mirror and asking myself if I like it. If God likes it. If it’s worth continuing down that path. Most of the time when I do this, I realize I missed a turn a little bit ago, and I’m headed in a direction that isn’t most favorable. Or maybe I’ve taken a wrong turn and need to get back to my original path. Funny how I rarely find that I’m right on track. I think that might be the nature of being human. I might be “there” with personal hygiene (you have no idea how many times a day I wash my hands), but my neatness is lacking at times. It’s like those sound balancing things. You know what I’m talking about? how you can change the bass and the treble and balance it out so that it sounds right? You just slide one lever up and slide another one down. Balance. Re-evaluation. Purging. Renewal. These are my sumer themes, I believe. 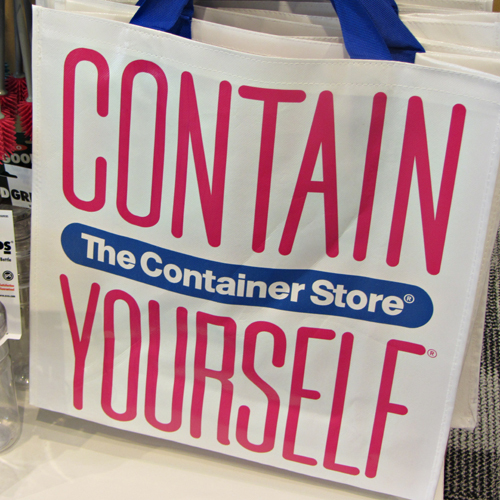 Yes, that is a bag from The Container Store. Also known as the happiest place on earth and one of my destinations for today. There’s a reason that they need to put that disclaimer on the bag: you could really go crazy in that place and end up with enough organization assistance (and fun extras that are just plain ingenious or über useful) to drain your life’s savings. So, that’s the reason for the bag. This displays pretty well what’s going to be going on today as I shop with my friend: She’ll be pushing the cart, and the guy in front shows what I’ll be doing. Now, there’s a strange disconnect here, because as I sit in my room, my bedside table is covered in random junk (and not so random junk). I can’t see an inch of my desk, so my laptop lives on the floor next to it. My closet can’t close anymore because I just can’t fit stuff in there. It’s ironic in many ways. 1) I haven’t done The Purge yet (aka, cleaning out my entire life, which I have planned on doing for a while as a first step towards going to college and preparing to move out). So I don’t seem to have enough room for all these organizational miracles in my room. Not to worry, folks. I have the guest room to put all my purchases. So kind for worrying though. 2) It doesn’t seem like I have any interest in being organized if you look at my room. Now, I could give you the whole schpeal about how I grew up as a pack rat with an extreme dislike for cleaning up my space. I could tell you about how I feel like since I spent so many years without organization of any practical kind, I’m too far behind to simply “clean up.” I feel like I need to move out of my room and move back in again, which is basically what I’ve planned on doing this summer. Or I could just tell you that I might feel like I’m in over my head and a little too unmotivated to get out. Is that how people with drug addictions or alcoholism or something else like that feel? Like there’s too much messy work involved in getting better? That might be a stretch, but it makes me understand a little more. I suppose if you felt like the effort involved in getting to where you wanted to be wasn’t simple or a one-day job, you might put it off or never start entirely. It might seem like you just have to settle for what you’ve gotten yourself into. I haven’t ever really thought of it that way before, that anyone could have a valid reason for staying in such a dark place. It’s all about hope, I think. If you have hope that things will change, you’re more motivated to take a step towards something different than what you’ve been experiencing. And that’s why Jesus is so important. It all comes back to that, doesn’t it? Jesus is vital. Huh. I’m not sure if that was disappointing or not. I think I’m pretty unique. I mean, no, I don’t bike to work (it’s like 13 miles, uphill both ways, with lots of traffic… and I also don’t have a bike – though I do have some really well-loved rollerblades) and I don’t own a record player (though that would be so cool. I wish I had the affluence to sell all my CD’s and my iPod and stereo in exchange for everything on vinyl and 8-tracks, but I really can’t afford that). And I do love my macbook, which is probably not hipster at all. But I do yoga sometimes. And I have a blog (you’re reading it). And I love taking pictures. And hanging out in Uptown Minneapolis with all the real hipsters. I spend a lot of time learning about social justice and reading classic writers and listening to Cities 97 and a whole bunch of people you might have never heard of – and might not ever hear of. And I play guitar. and a little ukelele (thanks to my grandma). Apparently I say “pajamas” differently than every one else in Minnesota. And I continue to name all my significant inanimate objects even when people give me derisive comments about it. HAH. But you might be a lot more hipster than me. If you own a bike, you already have points I don’t have. I might be just fine with not being a total hipster. Because, honestly, you’ll never catch me wearing that guy’s poncho thing in that picture – unless it’s a costume contest, in which case, IT’S ON! – and I will never dread my hair. Ever. Maybe that quiz wasn’t really questioning the right things. It was asking me how I like my jeans to fit (like a soccer mom, in case you were wondering) and how I listen to my music. But I thought the definition of a hipster was that there isn’t a definition, no “hipster” way to wear your jeans. It’s basically people just paving their own paths, not caring what other people think, not being afraid to be different and set their own trends. It’s like the epitome of being post-modern. maybe the label doesn’t really matter and won’t affect how I live. Since I haven’t really updated the look of this here blog for quite a while, I decided that today was makeover day. So, I got out my brushes and put my thinking cap on. I’ve been wanting to change my site name for a while now to something in English that more people can understand. I know I’ve mentioned this before, but I am a rather devoted Switchfoot fan, and I have been for about 9 years now. I love how much meaning their songs have, how each album is better than the last one (even though that one was great), and how simply sitting and listening to their music often confuses me and makes me think. I like it when things aren’t easily figured out, when people don’t just lay out the meaning for you. Sometimes I feel like the world spoon-feeds me ideas, meaning, principles, and that I just swallow them. “Stop” on those red octagons – I know exactly what that means. And that’s good. It’s good that it’s direct since traffic needs direction. But when we’re talking about ideas and innovation and changing the world – I think we need a little bit more room for people to get the gist, put in their two cents, and emerge with a better idea. Every time I hear that, it’s a reminder to check myself. Not only, am I who I want to be, do I have reputation that I want to have, but am I someone that God is proud to put his signature on? Those moments of reflection aren’t U-turns. It isn’t a moment where I think of who I want to be and who I am, compared side by side, and mentally highlight the things that I need to do differently. No, it’s more of a meandering. I wish I could U-turn sometimes, since that’s the more direct route to where I’m going, but the extra-long journey helps me to shape and mold the image of who I should be in a more complete way. Like all those times that I’ve taken a wrong turn while driving or missed my turn. I end up seeing a neighborhood or cornfield or a stretch of highway or row of shops that I’ve never seen before. Sometimes it changes my destination, and sometimes it changes how I’ll get there next time. And sometimes it simply changes how I feel about the place I mistakenly encountered. Either way, life really is about the journey. So, thanks for being here – whether you’re a long-time companion, a one-time visitor, or the occasional drop-in. I’m glad to have you here. The object formerly known as “my laptop” has now been christened with her own name (and gender to go along with it). Everyone, I present to you, my good and dear new friend, Matilda. There are only good connotations with that name in my mind. The book, Matilda, by Roald Dahl, was an innovative and brilliant children’s book, and the movie version did the book justice. I’m pretty sure there was a maid in a book or movie I encountered named Matilda too, and I’m fairly certain she was a nice, non-central character. Funny how names always carry feelings with them. Like when I hear the name Rinnie (not often as you might imagine, but similar sounding words can do that same for me), the connotation is of a girl in my class in first grade. I didn’t particularly like her – not that I disliked her, but she was in a different group and seemed a little strange to me – and when she left our school I wasn’t devastated. Then, after a rather short period of time, she came back. People were hugging her and getting excited about her return. And I hugged her and acted thrilled to have her back. I might have even jumped up and down a little and smiled really big. Maybe I actually was thrilled. But when I remember that day, I can’t remember whether I hugged her to conform to the pattern of my classmates or if I felt bad that there weren’t many people who were glad to see her back. Oh, how I’d love to think it was the second, that I was the noble first grader who acted in love and made a girl who was a little bit on the fringe of our little society in Miss V’s room feel welcome again. I wish I could go back to those days, to any day where I had a chance to break the mold of distance and barriers. I wish I could be the one to break down walls, to act in courage so that people could feel loved. I wish my name reflected that. Ashley. For some reason, in novels and movies, it’s always a snotty, rich girl who is popular but not because of kindness or charisma. Gonna be breaking some molds here. I got my roommate assignment today, and I think my roommate’s name (in addition to her address and phone number, all I was provided with) makes her sound nice. I hope she doesn’t see my name and think uh, oh. I got stuck with a brat. Breaking the mold, people, breaking the mold. Momentous occasions and meaningful words. 1) I bought my first piece of big-girl jewelry. It actually cost more than $10 and didn’t have a clearance sticker on it and just looks so adult. see, doesn’t that look grown-up? worth every penny. 2) I thought I was going to get my roommate assignment in the mail, but then I didn’t, so that’s more like a let-down. The third is really the most momentous of the occasions listed. As excited as I was to get a laptop simply because it would be useful, one of the big attractions was being able to blog in bed before I go to sleep. There’s something very enticing to me about being able to type out some of my musings from the day while I sit propped up with Bunny. Maybe it’s just that I feel like a real blogger now, not the girl who blogs from her family’s computer or from her phone (making many typos along the way). I have my own laptop, yet to be named (gender is not decided yet either), and I have a blog. And I get to store all of my documents in here and make whatever picture I want the background. And no one can complain. And I can blog while sitting in bed, without having to deal with a phone. Tonight, I spent time worshipping with a group from my high school. We sat outside and sang for a bit. I love hearing a mass of voices blend together to praise God, knowing that each one is giving Him praise individually but also corporately. The feeling of unity in Christ brings me contentment. I’m reminded that living life with Jesus is whole and fulfilling, not boring or empty. Not empty. Sometimes my praise feels a little empty, as I get easily distracted (by things like the bricks on the pavement and my new ring that I decided to wear), but there are some words that never fail to strike a chord within me, to grab my attention back to what’s important. I think they must say something about how God relates to me. Captive. Freedom. Redeemed. Life. Reign. Whole. Rescue. Don’t they paint a beautiful picture? The captive has been rescued and set free, redeemed and given new life by the One who reigns over all. He has made me whole. Do other religions promise that? Wholeness and being rescued? I haven’t encountered that mindset anywhere else, that we are the lost cause to be redeemed, all for love. There are just so few people who are willing to take on lost causes (if they have done it, there’s likely a book written about them since it was so unusual). No one wants to help someone who doesn’t want to get better. And few people have the tenacity to help those who seem too far gone. But that’s Jesus’ specialty. Specialty. I am a lost cause, and the Creator, Sustainer, and Savior of the universe specializes in redeeming me. I’m not going to waste your time lamenting about how sad I am that we’re in the car on the way to the airport, leaving the paradise of La Jolla. I’ll just weep as I write this and let the emotion stay with me. Our family got a little too excited about the perfectly clear day yesterday and spent about 5 hours at beach, ending up with bad sunburns. Thank goodness for aloe vera and ibuprofen. Good grief, this feels a lot more intense than a Minnesota sunburn! Either way, I’ve been walking around like a robot today since my joints are the most badly burned areas. So walking is a slow and halting process. My mom had the wisdom and good perspective to note that it’s a good thing it didn’t happen on our first day at the beach. And I have to say that she’s right, even though I’m not looking forward to three and a half hours on the plane like this. Jerry is high school dropout. He lives on his own, in the sort of shady area of Mission Bay, and since he’s responsible for himself (parents are both in the military, and he is over 18) he naturally has the assumption that someday, someone will be chasing him, hoping to hurt, rob, or capture Jim. So, he practices running. He runs fast and furiously, as far as he can, as a way to survive. Maybe that’s a habit I should take up. I have a very short list of animals that I like, and I’m sure I wouldn’t like any of them wild. 2. A few furry pets but only because they are cute and belong to other people. If you would like to buy me a stuffed version of either of those I would not refuse. My dad and I spent a lovely day at the San Diego Zoo today, which beats the pants off any zoo I’ve been to in Minnesota. The animals were all outdoors, there were palm trees around, and I got to admire a whole bunch of animals from a distance, the way I like them. I learned a bit about animals, and I also learned that painted lines on asphalt can be slippery when they’re on a hill. Be careful, people. The animals and I kept our distance from each other, but I was very complimentary of most of them, so we’re on good terms. I’m just on better terms with stuffed animals. I may have already mentioned this story, but I have a very special friend. We met in Macy’s (before it was Macy’s; it was still Marshall Fields then) in second grade. I was there to buy an Easter dress with my mother, but I looked up at the shelf and saw this beautiful, big, fluffy, purple bunny. And I didn’t want an Easter dress anymore. I wanted that bunny. My mom, however, didn’t come to Marshall Fields to buy a large, purple bunny. But when my grandma came into town and told me I could pick one thing I wanted for my birthday, I knew exactly what I wanted. I wanted that bunny. And I named it in the most original way possible. Over time, his name has been shortened to Bunny. He has been all over the US, to Panama, Costa Rica, and he’s played many roles in my life: confidant, plaything, snuggle buddy, etc. He’s been drooled on, cried on, and even gone through the washer and dryer multiple times. You can’t send a real bunny through the washing machine in a pillowcase. Well, there’s my Bunny for you. My mom thought I said “pro-am”, so she thought we were talking about golf, but the website said surfing, so I assumed that bro-am was the official term for a surfing contest. And then you crowd in with a top of other people on the sand and get super excited when you see Jon, Tim, Andrew, Chad, and Jerome come out onstage. And you beam at your family saying, “I’M SO HAPPY!”, and they look back like we’re happy that you’re happy, sweetie. And you sing your lungs out even though you’re not really around other people who know these songs by heart (why not, people?). Then you dig your toes in the sand and wave your arms when they tell you to, and you cheer loudly whenever you can – because you’re so happy. And it’s even better because it’s benefitting a great cause – helping to end the cycle of homelessness for kids, offering them hope. And isn’t that one of the best gifts you can give someone? By the end of all of this you’ve realized that it’s a play on words – bro-am. Like brotherhood, like loving your community. And it happens to include a surfing competition. And the band that you’ve loved since 4th grade. For nine years. Which is half of your life. And you just know that this music is going to continue to be meaningful to you because the messages are so pertinent and real and challenging. Because it’s about fighting apathy, living as an extension of God’s love, about being more than our society expects you to be. And I like that. Couple all of that with incredible and ingenuitive musical talent and you have (da-da-DA!) my favorite band, Switchfoot. And that is my story, of an almost perfect day which also included about an hour and a half of sun at the beach, discovering a cool coffee joint, buying a yellow belt for $5, and watching my family eat the barracuda that he caught that morning (no joke, but do you know how many jokes you can make about barracuda? Brooke wandered around going “CUDA” in a low voice for about half an hour, and we named the fish Barry, and my mom came up with BARBECUDA!). almost perfect day. And I planned just about none of it, so thank you, Jesus. It may actually be the happiest place on earth, if you count happiness by smiles and laughter per square foot. It seems as though everyone who sets foot through the door is instantly carefree and thrilled to be in the presence of such magic. Well, everyone except the sweet little boy who got lost – spotted near Space Mountain crying and holding an employee’s hand who was saying, “we’ll find them.” I think I might love that employee. Anyone who comforts sweet little lost children is high on my list. And I suppose the little girl who was wailing about her fear of Storybook Land canal boats might not have felt very happy. But I bet she felt better after her mom let her pick a new ride. Nearly all of the problems encountered within the walls of Disneyland are curable by a change of scenery – don’t like the roller coaster? Just ride around in a honey pot in Winnie the Pooh’s ride – or a Mickey Mouse shaped ice cream treat consumed while watching Disney characters dance by in the parade. I had only a few things that I felt that we absolutely had to do yesterday, but one of them is still unfulfilled: I wanted to wait in line to hug Pooh and tell him all that he’s meant to me over the years. But when I dragged my family into the line with a 30 minute wait, they cut the line about 10 feet up so that Pooh and Tiger could take a break. I hope it was a really nice break, because it broke my heart. I was going to speculate about the guy/gal who plays Mickey Mouse (Sorry if this is your first time hearing that he’s not a real mouse), but we met some more interesting people yesterday, about whom we know little. Tony and Jenny: the newlyweds. 3. They are both short. 4. They were in our log for Splash Mountain yesterday, getting upset at being wet – just like us. 5. They will have our picture with them forever since they bought the one taken as you go down the biggest hill towards the biggest splash. So, without further ado, here is the story of Tony and Jenny. Jenny didn’t like Tony the first time she met him, at the dentist’s office where she is the receptionist. He mumbled his name, looked rather scruffy, and didn’t smile much. After his root canal that day, as he walked through the reception area to the healing room (still under the influence of laughing gas), he smiled at her as big as the gauze in his mouth would allow him to and asked if she wanted to get lunch with him (in a slightly muffled and distorted tone, due to the gauze). Jenny laughed and said she would, certain that he would forget this after the effect of the gas wore off. And after five long years of waiting for Tony to pop the question, he finally did: right in the middle of the dentist’s office. Now they are happily married and on their honeymoon in California.